Living Space: 4004 sq. ft. This unique property on Costa Ballena will captivate you as you step out of your car with sweeping views of ocean and mountains. Only a minute from the main highway, you immediately understand what location is all about. Quick and easy access from the Costanera with a 2wd vehicle, two houses with ocean and mountain views, infinity edge swimming pool surrounded by immaculate tropical gardens… this family compound has these elements and more. The Land: The owners hand-picked this 2.14-acre lot because of the location and privacy. The property is built on a knoll with excellent drainage that sits at an elevation of just under 500 feet above sea level. A bamboo hedge surrounds the property providing additional privacy. The Houses: Built in 2007 as a family compound, the houses are immaculate with close to 4,000 square feet of living space combined in the two-story main house (3 bedroom and 1.5 bathroom), the two-story guest house (1 bedroom, 1 bathroom) and the covered lanai dining area at the edge of the pool. The view from the upper floor of both houses is spectacular through the 360 degrees of screened, cantilevered windows. This open design allows a free flow of air while providing protection from the elements. The house are surrounded by Spanish tiled walkways with extra wide eaves to protect from the rain. Three of the bedrooms are equipped with air conditioners. There is a caretaker studio with shower built under the guesthouse, as well as, the laundry room and pump house for the pool. 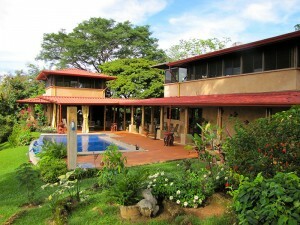 The Location: Ocean view villas only a minute from the highway… this property has that! The town of Uvita is a mile from the property gas where you have access to grocery stores, banks, doctors, pharmacies, etc. Situated just below the costal mountain range covered with lush jungle, the property’s location is as majestic as it is uplifting. Secured by an electronically controlled gate at the foot of a 150-meter gravel driveway that leads to a 3-car covered carport. Water is supplied by the city of Uvita, and it flows into a 2,400-liter holding tank in a separate pump house 50 yards from the main house. Equipped with TV, WiFi Internet, interior/exterior alarm system that is monitored by the security company ICR. This property has been a very popular destination for home exchanges (35 in 7 years) and occasional rentals. It has the location, it has the houses, and it has the views… all it needs is you!